A friend of mine, Vicky, recommended this book on her blog Tramps Camp. 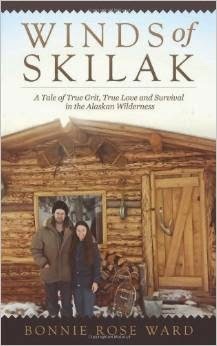 I’d read most of the other titles on her winter reading list, but this book about Alaskan wilderness living was new to me. Winds of Skilak: A Tale of True Grit, True Love and Survival in the Alaskan Wilderness is the memoir of Bonnie Rose Ward. Bonnie and her husband Sam were from Ohio. Bonnie was a city girl, but Sam grew up on a farm where he learned how to hunt and became a jack-of-all-trades. They started out with a traditional town life, but Sam had a dream of living off the land in Alaska. So in 1980, at thirty-six years of age for Sam and twenty-five for Bonnie, they sold their home and packed up for the long drive to Alaska. They searched for property until they came upon land on Caribou Island in remote Skilak Lake near Sterling, Alaska. A funny side note, my sister and her husband have built a cabin home in Sterling and love it there. But their location near town makes their lifestyle much easier. Bonnie and Sam arrived in late spring and began cutting trees, stripping logs, and built a rustic cabin home before winter arrived. Bonnie’s memoir chronicles their first three years of cabin life, it’s challenges and joys. Sam was steadfast in his belief that they not only could live in the wilderness, but make a living there as well. Bonnie followed her husband, and in time became a “wilderness woman” herself. 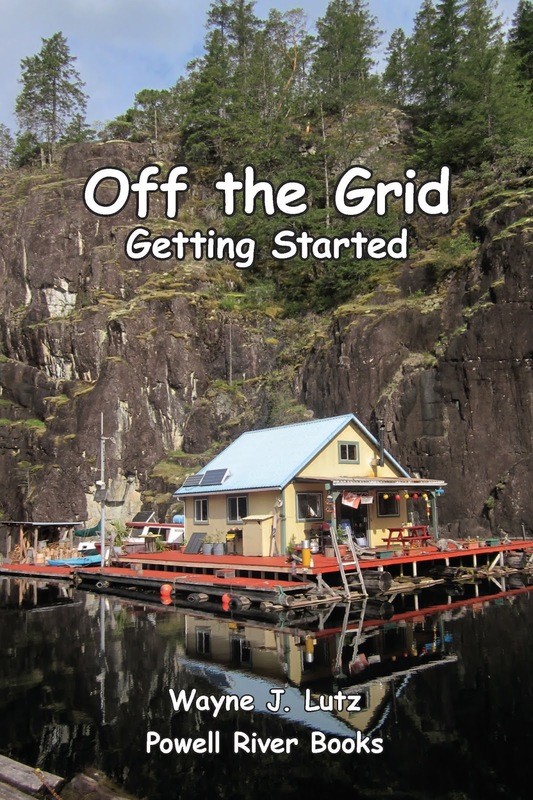 I enjoyed reading about how Bonnie learned to can, cook, and keep a home without the luxuries of town life: electricity, water, sewer, stores and close neighbours. Even at our off-the-grid cabin I have the luxuries of propane appliances and lights, solar and wind for minimal electricity, and water hand pumped up from the lake right under our cabin floor. And we don’t have to contend with such cold winters or to make a living from our land. In a way, it makes me feel a bit guilty that I have so many resources to make life simple. Stories about travel on Skilak Lake remind me of travel on my Powell Lake. The video above by Eric Bushnell on YouTube gives you an idea about how severe Skilak can get. We too are governed by the weather and storm waves, but Wayne is much better at listening to me when I’m afraid than Sam was for Bonnie. Maybe that means I’m not yet a “wilderness woman” willing to take anything Powell Lake has to dish out. John on an old growth cedar burl. The hills of Coastal BC are covered in a mix of evergreens and deciduous trees. Where we live there's a predominance of hemlock and fir, but mixed in are a substantial number of cedar trees. On the lower slopes near our cabin you find Western Redcedars, but in the high country there are the more valuable Yellow Cedar trees. Both are in the Cypress family. 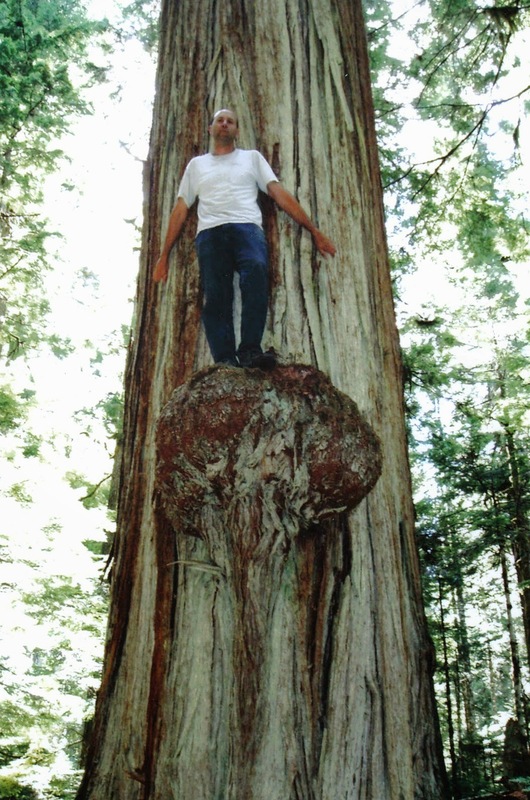 The Western Redcedar grows in moist to wet soil. They are shade tolerant, but when they reach their full height of 60 metres (200 feet), they can do the shading. The leaves are scale-like and form flat drooping branches, as opposed to the needles on pines, firs, and hemlocks. Many small brown cones appear on the branches and seeds germinate quickly in open and disturbed areas along roadsides and in logging slashes. Young cedar growing out of an old cedar stump. Cedars have a distinctive trunk that flares out at the bottom. When old growth trees were harvested, loggers used springboards to cut above these wide bases. Today you can find many huge old cedar stumps still standing in groves of second growth trees. Cedar is a very durable and lightweight wood. It's excellent for indoor and outdoor construction and furniture. It has a nice colour (and smell), and resists rot and pests. Mid-1900s cedar logging camp outhouse. The Western Redcedar was a vital part of life for Coastal BC First Nations people. For this reason, it took on special spiritual significance. The wood was used to construct shelters, dugout canoes, totem poles, tools, arrows, masks, and paddles. The bark became clothing, rope, and baskets. Cedars were also used for medicinal purposes. Nothing was wasted. It really was their staff of life. Steam Donkey No.1 on a cedar log sled. Quad riding in the winter can sometimes be problematic. We get snow in the high country that blocks our passage, and we get rain that makes riding not as much fun (at least for me). Last week after some trail building to create a spot to offload our quads from the barge and intercept an old logging road, we decided to go up Museum Main in search of the steam donkeys. Piston to turn the cable drums for extension and retraction. There are two donkeys in the bush above Chippewa Bay on Powell Lake, but with shorter riding days we opted to go to No. 1 and only scout out the way to No. 2. Levers that were once used to operate the drums. Our good friend John took me to Steam Donkey No. 1 years ago. Then we had to slog through some pretty bad slash and under growth. Now Museum Main goes right by Donkey No. 1. Massive steel drums that played heavy steel cables in and out. We almost didn't make it because of the snow on the road. But then there we were. There's a short trail from the main up into a grove of second growth trees that were preserved around the steam donkey. Starting a fire in the boiler to warm our hands. 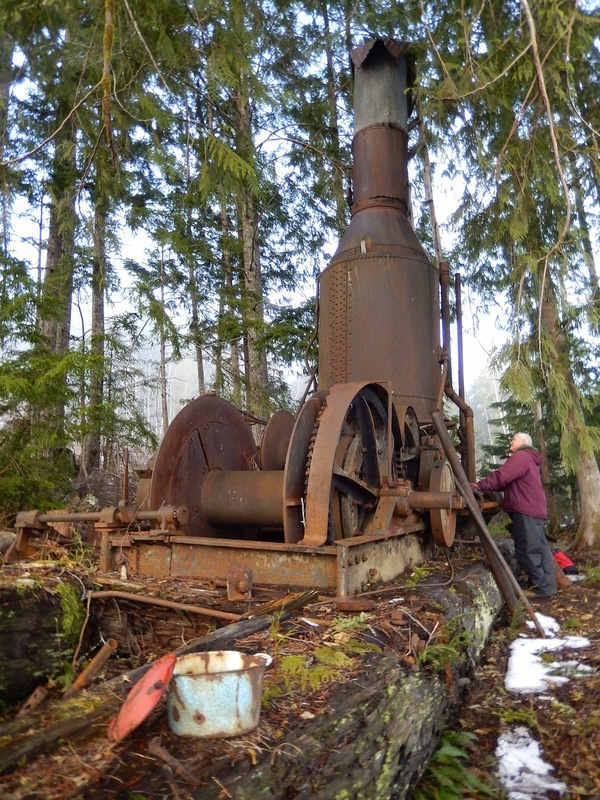 The old steam donkey was used to yard logs from up high up on the hill down to Powell Lake to float down to town and either to the mill, or out to sea to be delivered to Vancouver. Many steam donkeys were abandoned in the bush when logging operations were completed. This was the case for the two up Museum Main from Chippewa Bay on Powell Lake. A few have been lovingly restored and maintained like this one in a YouTube video by tubesmartine. Black Huckleberry bushes along the Last Chance Trail. At the higher elevations around Powell Lake, and throughout the backcountry in our region, you will find Black Huckleberry bushes. They are mostly found in boggy areas, but I've also come across them on rocky slopes like this one. I happen to be standing on the Last Chance Trail that's a tough shortcut over the Bunster Range for quad riders who want to get to Chippewa Bay on Powell Lake. Black Huckleberries (Vaccinium membranaceum) grow on a medium-sized shrub that grows to one and a half metres (5 feet) tall. It has many branches and small pointed leaves. Late in the season the plants will turn reddish brown and round purplish berries, much like blueberries, will form. If you try to pick the berries early, they are hard and tart, enough to pucker your mouth. 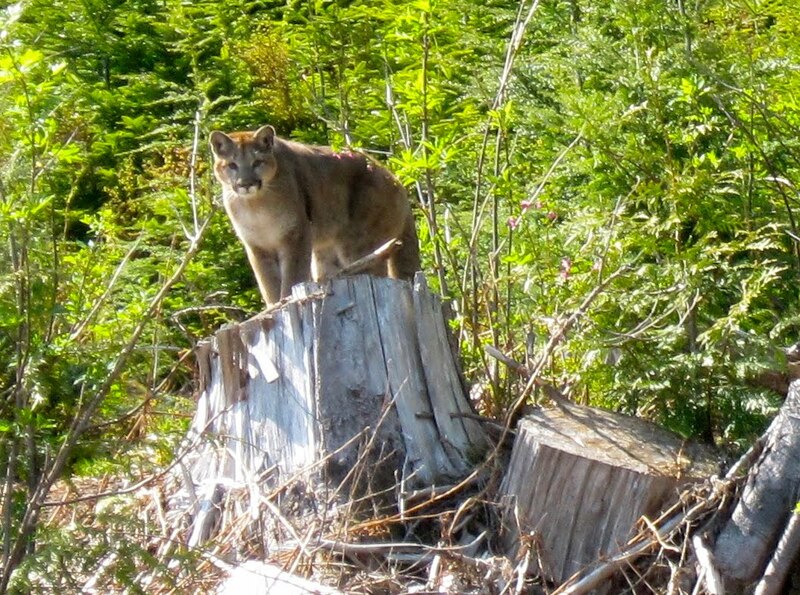 Today I had the pleasure of being a guest blogger on Powell River Daily News. It's my go to blog for information about my home town that's written by Drewen, also known as citizenjournalist. Earlier this month there was a post about Powell Lake, and it prompted me to leave a comment. Almost immediately I got a response from Drewen inviting me to be a guest blogger. You can head over there to see it for yourself. Here's a reprint. Wayne with the Kemmerer bottle. My husband Wayne and I live most of the year in our float cabin up the lake. We discovered Powell River on holiday in 2000 and ventured onto Powell Lake when we returned in 2001. Float cabins captivated us. Our cabin began as a holiday retreat, now it’s our home. While seeking information about Powell Lake, we discovered the results of oceanographic studies conducted by the University of British Columbia in 1962 and 1972. Oceanic? Yes. Powell Lake is one of the deepest lakes in BC recorded at 360 metres (1,180 feet). It was created when glaciers scoured out its fjord-shaped basin. If you travel up any of the inlets along the BC coast, they look virtually the same as Powell Lake. The difference is they are filled with seawater. In the case of Powell Lake, after the glaciers retreated, the surrounding land rose and seawater was trapped. Over the years, fresh water increased the depth of the lake, but did not mix with the heavier salt water at the bottom. What was discovered at the bottom of Powell Lake in 1962 was some of the oldest trapped seawater to date, about 10,000 years. The lake becomes salty at about 122 metres (400 feet) and at the deepest levels was found to contain methane and hydrogen sulfide, which gives it a distinctive rotten egg odour. It contains no oxygen or life other than possible bacteria. This information sparked our imagination. Margy hauling in 1000 feet of line. First we tried to think of a way to build a deep-water sample apparatus of our own. In the end, we went to a friend and borrowed a Kemmerer bottle designed for such a task. 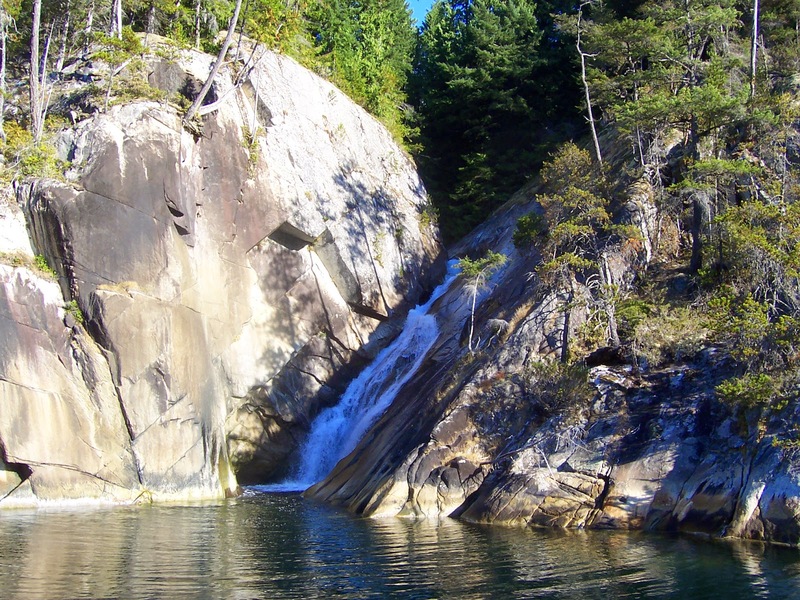 On October 21, 2006, Wayne and I conducted our own deep-water drop of 335 metres (1,100 feet) in Powell Lake. We were really excited when we opened the Kemmerer bottle and discovered our own 10,000-year-old water. Yes, it was yellow and smelled of rotten eggs. You just never know where your imagination can lead you. In our case, it led us back 10,000 years. Want more information about the drop? 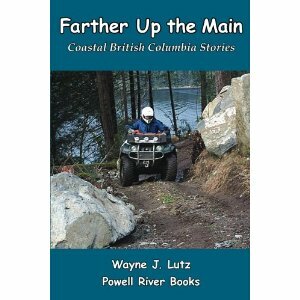 It’s included in Wayne’s book Coastal BC Stories: Up the Strait. Books in this series are available locally at Coles in Town Centre Mall and Breakwater Books on Marine Avenue, and e-books through Kobo and Amazon. 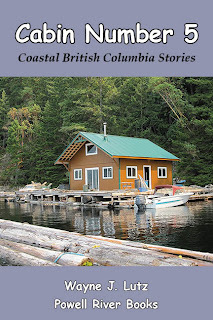 You can go to our website www.PowellRiverBooks.com for more information. UBC research team led by Professor Pawlowicz. We usually save our boat trips up to the head of Powell Lake for spring when the waterfalls are running fast and heavy, but a sunny winter day after a night of rain drew us up to see what was happening. The falls were full and the reflections on the water were amazing. Here's a tree that caught my eye because of the fungus growing up its trunk. I believe the tree was a fir, and it was healthy looking. There were so many fungi, and they ranged all the way from the roots up to about fifteen feet. Doing some research online, I believe it is Granoderma applanatum, more commonly known as shelf fungus or artist's fungus. 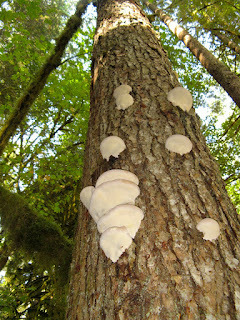 It's called artist's fungus because carvings on the white underside will darken to create scrimshaw-like images. The tops were brown, almost the same colour as the trunk. The undersides were a brilliant white. Zostera marina is commonly known as eelgrass. Eelgrass is a perennial aquatic plant that lives along the ocean shoreline in cool northern waters. Rhizomes hold branching slender stems with flat thin leaves to the ocean floor in shallow, protected areas. Flowers and seeds distinguish it as an aquatic herb rather than a seaweed. Eegrass provides an important intertidal habitat for fish and shellfish. Beds, also called eelgrass meadows, flourish in spring and summer, then die back in fall and winter. You often find huge mats washed up on shore, or floating in masses across the ocean surface. 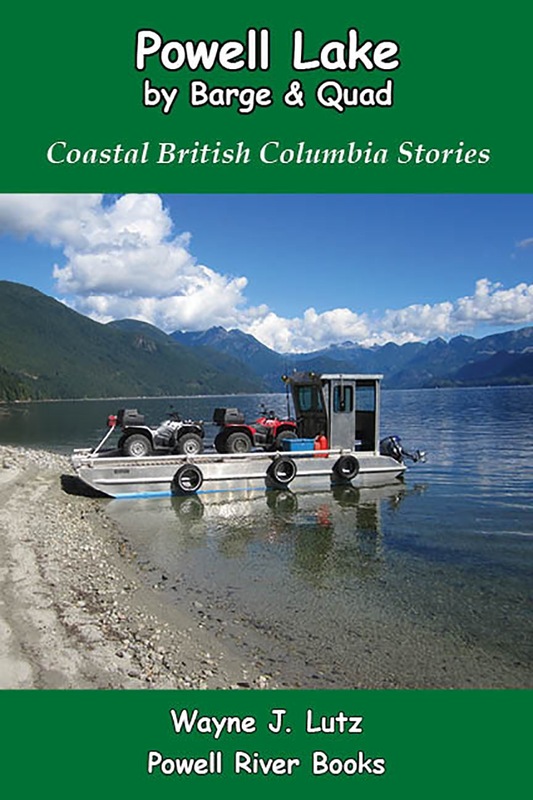 An eelgrass study was conducted in 2003 in Okeover and Malaspina Inlets north of Powell River. The study discovered 40% of the shore had soft sediment or protected areas suitable for eelgrass. The remainder of the area had cliffs, steep boulders, or rocky beaches. Twenty-one sites with 32 beds were identified in the inlets. Because the area is important for oyster and clam production, it's important to keep it unpolluted and health. Here's a YouTube video by Shaw's Oceancast TV. Coastal BC is home to individualists and self-reliant people. It's been that way since first occupation by First Nations, through early European settlement, and into the present. The remote nature makes it so. Large cities like Vancouver and Victoria give way to towns diminishing size with increased distances in between. Many places are only accessible by boat. Following World War I, Canada encouraged farmers to immigrate and settle in the west. The Solberg family left Norway in 1926, enticed by the opportunity to start a new life. Herman Solberg had farming experience, but chose to go to Vancouver and work in the city. When he lost his job, he moved the family up the coast to homestead on Sechelt Inlet. Here he built a life in the harsh wilderness and with his wife Olga, and raised his two daughters Bergliot and Minnie. Both girls grew up without formal schooling, and learned hunting, trapping, and logging at their father's side. They became as tough and independent as the land on which they lived. And they both became famous in the Sechelt community in their own way. The Cougar Lady: Legendary Trapper of Sechelt Inlet written by Rosella Leslie has is a book about the life of Bergliot Solberg, known as Bergie. 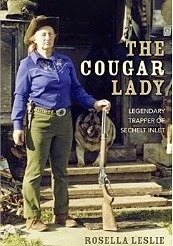 Because of her hunting prowess, she attained the radio handle Cougar Lady. The book chronicles the life of the Solberg family, with an emphasis on the exploits of Bergie. And there were many for this woman who was as tough and independent as a man. I enjoyed the book for several reasons. I have a Norwegian background. My grandmother's family arrived in the States in the late 1800s with a similar desire. The picture of Bergie's mother Olga reminded me of gramma with her long brown hair pulled back into a knot at the back of her neck. I admire Bergie and her sister Winnie for being so independent and self-reliant. They lived their lives by their own rules. Growing up in the big city, I felt just the opposite. And of course, Sechelt is near our home in Powell River, where we are living up the lake in a float cabin. Maybe there's hope that a little of Bergie's independence and self-reliance will rub off on me. During late spring, summer, and early fall, our "ocean boat" is in Powell River's North Harbour. There she's ready to cruise on a moment's notice. But during the cold months, we pull her out to go into winter storage. That way we can conduct our annual maintenance, and keep ahead of the critter growth on her hull and leg when she's not in use. This is the first season our Bayliner 2452 has been in Powell River. She arrived via trailer from Bellingham last spring following an engine change in Port Moody. We had lots of fun cruising during the warm months to places like Nelson Island, Campbell River, Quadra Island, and up the coast as far as Blind Channel and Forward Harbour. We took our boat out of the chuck (ocean), and put her into Powell Lake to flush the salt water out of her systems, and to give her a fresh water bath up at the cabin. Then we put her on the trailer and took her to the hanger at the airport for what I call "cold storage." Because we do get freezing temperatures, Wayne put antifreeze in her fresh water system and the holding tank for the head. We drained any residual water out of the engine's leg, and put boat heaters in the interior to keep mildew at bay, and in the engine compartment to keep anything from freezing. This month we'll pull he out for an engine run. It isn't good for engines to sit idle for too long. But we won't put her in the water for that. We'll use muffs and a hose to water cool the engine while it runs on land.